Hi everyone!! It's Fabby Friday over on the Tiddly Inks Challenge Blog. I hope the design team samples inspire you to get crafty this weekend. 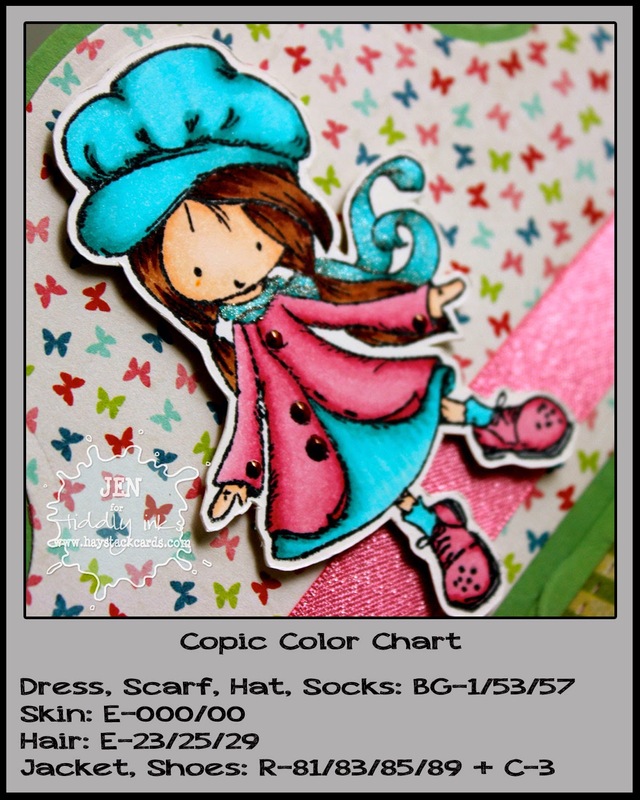 Today, I am sharing a card that I made using the Tiddly Inks clear stamp set that was included in an early September edition of Quick Cards Magazine. This adorable little girl - Wren in the Fall - is such a versatile image. Instead of using traditional Christmas colors, I used bright pinks and blues to go with the fun butterfly background on this birthday card. The card base was super simple to create using the Framelits Royal Stand-Ups Die from The Stamps of Life. This set includes 22 dies to create various coordinating layers and even several word dies. I also tried out my new Wink of Stella glitter pen in clear - wowza - why didn't I get one of these pens before now? I love it!! Can you see the sparkles on her scarf in the above photo? You can also see the faux enamel dots on her jacket. I learned this little trick from Laura Fadora. For my card, I dabbed on little dots of Ranger enamel accents in white and then colored them with my Copics once they were dry. Great card! Such a cool shape. Absolutely to cute! Thanks for stopping by and playing with us at Mema's Crafts. Good luck and we hope to see you again.